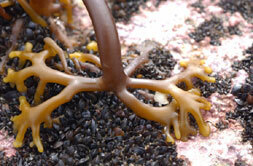 These are two small genera of large brown seaweeds commonly called kelps. The sporophyte is the dominant phase and the gametophyte is a microscopic phase. There is therefore an alternation of sporophyte and gametophyte. Sporophytes of both genera are differentiated into holdfast (below), stipe and lamina; the gametophyte is undifferentiated and is filamentous and creeping. Sexual reproduction is oogamous; antherozoids (male gametes) are produced by a male gametophyte and eggs are produced in oogonia by the female gametophyte. The female liberates a pheromone called lamoxirene, a low molecular weight (C11), volatile hydrocarbon which, in addition to attracting the sperm, initiates their release from the antheridia of the male gametophyte. Fertilization takes place with the egg partially extruded from the oogonium and the zygote develops in situ to form a sporophyte (the macroscopic kelp). The sporophyte develops sporangia on the surface of the blades in unilocular sporangia (called such because they are not divided by cross walls or locules); the contents of these sporangia divide meiotically and form numerous flagellated zoospores which are haploid. These zoospores swim away and eventually settle and develop into the gametangial thalli. The life history is therefore heteromorphic; the gametophytes and the sporophyte have a different morphology. Laminaria and Saccharina species are found on rocky shores at low tide and in the subtidal to depths of 8-30 m in the north Atlantic and north Pacific; some species occur at depths of up to 120 m (Mediterranean and Brazil), but this requires extraordinary water clarity. Kelps are eaten as Kombu and Haidai in Japan and China, respectively, and in a number of south-east Asian countries. The most eaten species, Saccharina japonica and Undaria pinnatifida, are now cultivated in China, Japan and Korea. The cultivation method is simply to attach young plants to ropes suspended on flloats. 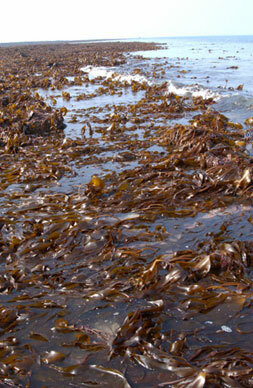 Growing high-quality kelp is, however, a specialised business. Alginates are produced in China from kelps grown on ropes. World production of Laminaria and Saccharina is summarised by Surialink. China alone produces about 700,000 mt of Saccharina by rope cultivaton. Site © M.D. Guiry 2000 - 2019. Important copyright notice: all text, design and photographs on this site are copyrighted by M.D. Guiry unless otherwise stated and all rights are strictly reserved. Click here for copyright information and contact. Website design: 249 Design Studio. Site maintained by M.D. Guiry (michael.guiry@nuigalway.ie). There have been 8724613 page loads since 1 January 2014 on 22 April 2019.